BAGHDAD, Iraq, August 2, 2013 (ENS) – Drained by development and nearly destroyed under Saddam Hussein’s regime, the Central Marshes of Iraq have now been declared the country’s first national park. The Iraqi Council of Ministers approved the designation on July 23. The efforts to declare this unique landscape a park and protected area began in 2006 through a joint effort by Iraq’s Ministry of Water Resources, Ministry of Environment, and Ministry of Municipalities with support from Nature Iraq, an Iraqi environmental conservation organization, and other national and international institutions. Financial support for the effort came from the Italian Ministry of Environment, Land and Sea. The Mesopotamian Marshlands of southern Iraq were once the third largest wetlands in the world, originally extending between 12,000 and 15,000 square kilometers and partially covering the three southern governorates of Iraq: Missan, Thi Qar and Basrah. They were a vital resource for regional fisheries, reeds, and other natural resources; the home of the indigenous Ma’dan Marsh Arab culture, which is directly linked to ancient Sumeria; and a globally important area for large numbers of migrant and wintering birds, and the native habitat of endemic birds and other valuable wildlife. In the 1990s, the Saddam regime conducted a campaign to completely drain the marshlands, reducing their footprint by nearly 93 percent. The United Nations Environmental Programme called this action the worst environmental disaster of the last century. After Saddam’s overthrow in 2003, local people and the government took action to restore the waters, and the southern marshlands, though changed, have returned, as have the birds, fish, water buffalo and the Ma’dan, and remain a vital economic and ecological resource. Nature Iraq applauds the difficult work done by the staff of the Ministry of Water Resources, the Ministry of Environment, and the National Park Committee to make the park a reality although much work remains to be done. Nature Iraq has won the support of the government in its mission to restore the marshes. On July 18, Ali Esmaeel, secretary to the Iraqi Council of Ministers, expressed the willingness of the council to cooperate with Nature Iraq and support its projects related to the restoration and development of the Iraqi marshlands. “The secretariat is highly interested in the activities of the organization,” said Esmaeel at a ceremony of nature, agriculture and environment which honored the achievements of Nature Iraq. 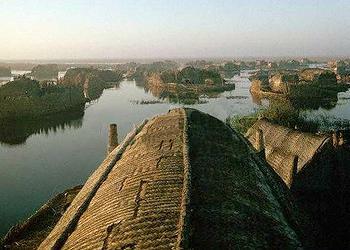 “The issue of the marshes is related to cultural and historical heritage and involves economic and social aspects. The marshes represent one of the fundamental pillars of the country and focusing on them means dealing with very important social and economical issues as well as water resources,” said the secretary. He said the council is conducting projects in the marsh areas after the abolishment of the State Ministry of the Marshlands. Alwash drew the attention to the potential impacts of Turkey’s Ilisu Dam, currently under construction, and the necessity of reaching agreements with Turkey to reduce the impact of the dam on Iraq. Rahman Hasan, another government official, emphasized the importance of developing programs in marsh city of Chibayish in Thi Qar governorate as a strategy for the marshes to have a prosperous tourist and economic future. Nature Iraq says that the park, if properly implemented and managed, can provide a refuge for Iraq’s marshland biodiversity and a sustainable boost to the local economy through park-related tourism and related socio-economic development projects.